Perfect Sunday Dinner [recipe] – Cin Cin, Let's Eat! I picked up some beautiful looking beef chucks (flanken-style ribs) the other day, with a nice Korean style marinade in mind, grill and serve ’em over piping hot white rice with some sauteed greens…mmmmmm! But after looking in the fridge when I got home, I realized I had quite a few ingredients on hand that I should use up soon, especially the basketful of tomatoes picked from our garden. Within 30 minutes, I had a big pot of meat ragu (well, more like a “stew”) simmering on the stove, and that smell would put a big smile on my face any day. Here is roughly what I used for this comforting plate of Sunday dinner. 1. To make the ragu: In a large, heavy saucepan, heat the olive oil over medium-high heat. Add the sausage and cook, breaking it into pieces with a wooden spoon, for about 5 minutes, until lightly browned and much of the fat is rendered. Using a slotted spoon, lift the sausage from the pan and set aside. Add the beef to the fat in the pan and cook for about 10 minutes, until browned. Season with salt and pepper. Using a slotted spoon, lift the meat from the pan and add it to the sausage. Leave the fat in the pan. 2. Add the onions and garlic to the pan and sauté for 2 to 3 minutes, or until lightly browned. Add the wine, bring to a boil, reduce the heat, and simmer briskly for about 3 minutes or until reduced by half. 3. Return the meat to the pan, season again with salt and pepper, and add the stock, tomatoes, basil, oregano, thyme, bay leaf, mushrooms, and carrots. Simmer gently for approximately 1 hour, or until the meat is tender. Skim any fat that rises to the top of the pan during cooking. Cover to keep warm and set aside. 4. 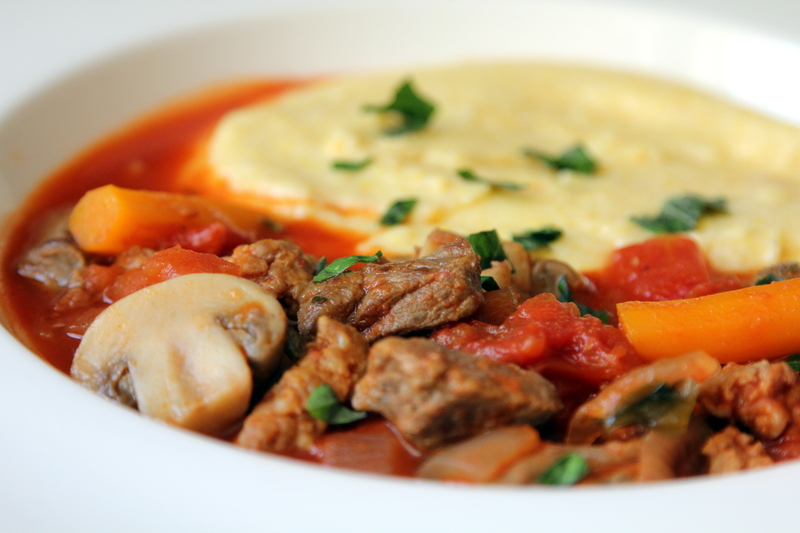 To make the polenta: Put the stock, cream, and milk in a saucepan over medium-high heat and bring to a boil. 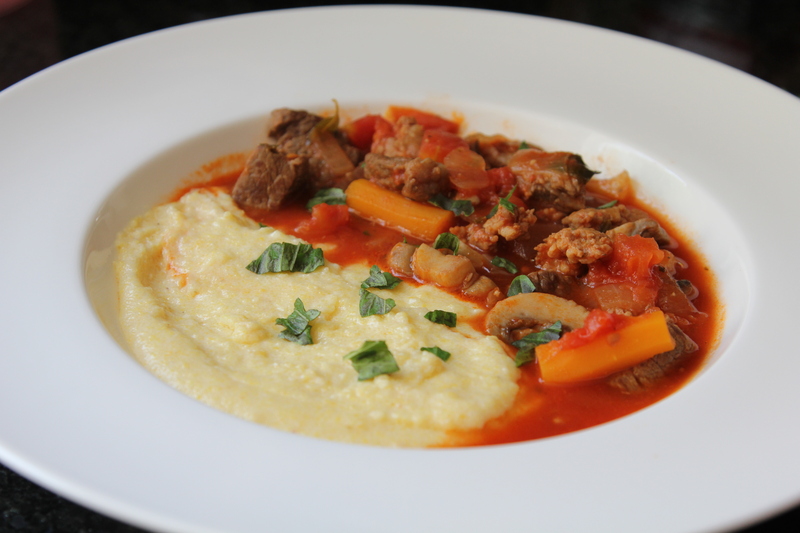 Slowly pour the polenta into the hot liquid, whisking briskly to prevent clumping. Reduce the heat to low and cook, whisking constantly, for about 10 minutes, or until the liquid is absorbed. 5. Add the cheese, stirring gently until incorporated. Serve in a shallow bowl with a ladle of the ragu, garnish with basil and grated Parmigiano-Reggiano. Note: If you don’t like finding pieces of tomato skin in the ragu, do one extra step – place clean whole tomatoes in a pot of boiling water that’s deep enough to cover the whole tomato. After 30 seconds to 1 minute, the skin should start to crack. Remove the tomatoes with a slotted spoon, place in an ice bath until they’re cool enough to handle. The skins should peel right off. This looks wonderful. I bet it’d also be good with grits for people who have those but not polenta. I love both. Oooh great idea! I’ll try this with grits next time! I LOVE polenta! Let’s please make this together sometime! And yes to grits, too! And shrimp and grits. Forgot to mention, your photo is gorgeous! !